Mince the Chorizo and heat in a saucepan on medium heat and add the shredded Fennel. Sweat the Fennel and mix in the toasted pine nuts. Take off heat and let cool. Once cooled, add the egg, bread crumbs and fresh sage and mix thoroughly. Set aside until ready to stuff the turkey breast. Butterfly the Turkey breast and lay out flat between layers of plastic wrap. Gently pound using a meat mallet to a uniform width (about ¼ inch). Season both sides with salt and pepper. Stuff the chorizo/fennel mixture into the Turkey breast by layering it on top of the breast leaving all edges clear. 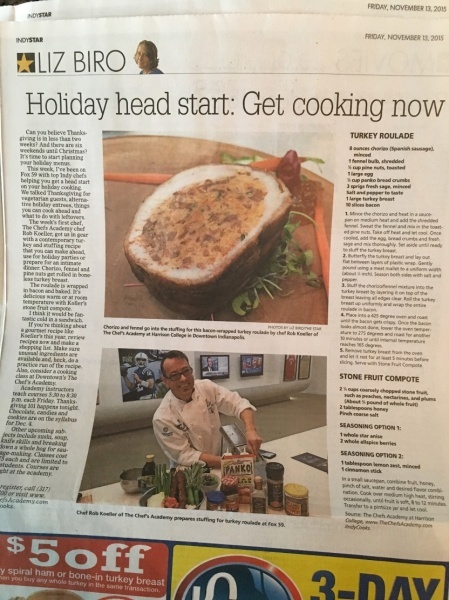 Roll the turkey breast up uniformly and wrap the entire roulade in bacon. Place into a 425 degree oven and roast until the bacon gets crispy. Once the bacon looks almost done, lower the oven temperature to 275 degrees and roast for another 10 minutes or until internal temperature reaches 165 degrees. Take out of oven and let it rest for at least 5 minutes before slicing. 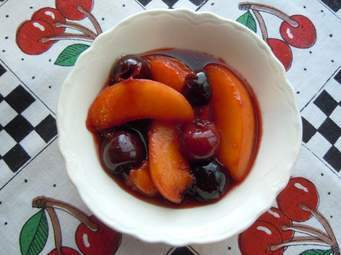 Serve with Stone Fruit Compote (recipe follows). 1. In a small saucepan, combine fruit, honey, pinch of salt, water, and desired flavor combination (optional). Cook over medium­ high heat, stirring occasionally, until fruit is soft, 8 to 12 minutes. 2. Transfer to a pint­size jar and let cool.